I LOVE this stamp set. It is so gorgeous!! I made a post awhile back using this stamp set over here, but I am not done using it yet. And, just because it called Painted Harvest, does not mean it is only for Autumn themed cards. Look how different it is when using other colors. I L-O-V-E this card!! I loved it so much that I decided to do it in Whisper White AND on Very Vanilla to see how it looks. With The Whisper White version, I stamped the flowers in Pool Party and then Tranquil Tide. Remember, this set is so easy to use because the flowers are created in a 2 step stamp sequence that is a win every time, but builds the dimension that you see. The leaves are stamped in Wild Wasabi and then I put the accent dots around with Sahara Sand. The center to the flowers are also stamped in Sahara Sand with Soft Suede accents on top. 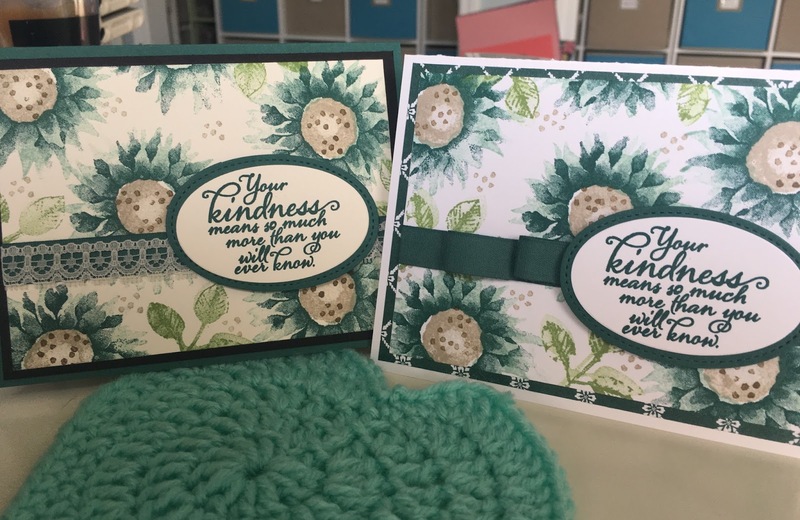 I stamped my sentiment with Tranquil Tide on Whisper White card stock and then used the Layering Ovals Framelits and the Stitched Shapes Framelits in my Big Shot to make the beautiful tag. The card face was then played over some of the beautiful Fresh Florals Designer Series Paper and then I layered the Tranquil Tide Finely Woven Ribbon so that it overlapped itself to create the embellishment as shown. For the Very Vanilla variation, I created the card face in the same way, and as you can see the effect is some what different and the colors came across a little more warm and soft, but oh, so lovely. When it came to the ribbon, I added a flat layer of the Very Vanilla Lace Trim over the Tranquil Tide Finely Woven Ribbon. Which one is your favorite? I am unsure myself, but they were so fun to make. I love stamping with this set!! In fact, I love it so much this is my 2nd blog post about it. Because of that, I am going to share a special bonus with you! For anyone that orders from me in the month of September, I am going to send you something extra special! So, follow my shopping links above and order from the Holiday catalog, or the Annual catalog, and I will personally send you out an extra special bonus! Your cards are gorgeous! I can't decide which one I like better. That Is a great stamp set.Glad I stopped by. Happy Day to you.